Contour NEXT test strips require no coding, which means one less step in testing and eliminates errors due to a user miscoding. The sip-in sampling quickly sips in your blood sample and the Second-Chance sampling allows you to apply more blood. 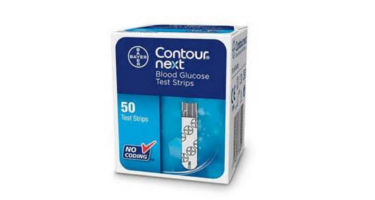 Contour NEXT test strips feature automatic compensation for many common interfering substances (such as acetaminophen and vitamin C). Compatible products: CONTOUR NEXT meter, CONTOUR NEXT EZ meter, CONTOUR NEXT USB meter, CONTOUR NEXT LINK meter.